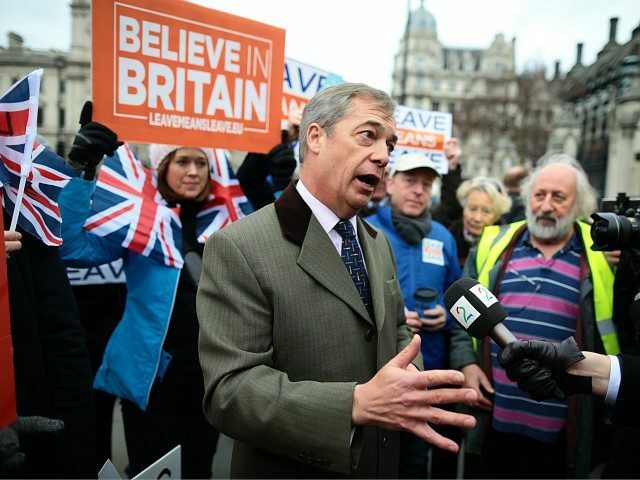 When asked on Sky News on Wednesday if he were offended by European Council President Donald Tusk saying there was a “special place in hell” for Brexiteers, the Leave Means Leave vice-chairman said, “No, not particularly. They’re scared, they’re rattled. They really worried. “I was in the parliament last Wednesday, I said that their arrogance and the behaviour of the unelected elites was driving British public opinion towards a WTO ‘No Deal’ Brexit. “And I saw the fear in Juncker’s face, in Barnier’s face, and it was interesting — before that comment, what Tusk was saying what that we must not have a no-deal Brexit.
.@Nigel_Farage: Tusk’s comment shows the EU are scared of a WTO Brexit. Exiting the EU on World Trade Organization (WTO) terms — rather than Prime Minister Theresa May’s Withdrawal Agreement that would entail a near-two year transition period, an Irish backstop that could lock Northern Ireland into the bloc’s Customs Union, and a £39 billion divorce bill — was voted the public’s favourite Leave option in a recent poll. On Thursday morning, Mrs May met with the Eurocrats who had been blunt in their position that they would not renegotiate the Withdrawal Agreement or backstop — the meeting resulting in no prospect of change, with the European Parliament’s Brexit Coordinator Guy Verhofstadt saying that the prime minister had assured him there would be a backstop after Brexit.